The Royal Avenue Theatre had its first production on the 11th March 1882 with a revival of Offenbach’s Madame Favart. The prefix “Royal” was very soon dropped from the theatre’s name. Comic operas, burlesques and similar shows remained the main source of entertainment for several years. For much of this time, Arthur Roberts, a very popular star of music halls led the company at the Avenue Theatre. In the early 1890s the emphasis of productions changed to drama and in 1894 Miss Horniman, the tea heiress, later a pioneer of the repertory movement, anonymously sponsored actress Florence Farr in a season of plays. Unfortunately, the first production wasn’t successful, however Miss Farr persuaded her friend, George Bernard Shaw, to complete his play, Arms and the Man, as a quick replacement which resulted in his first West End production. It was enough to convince him to drop his music critique in favour of play writing. 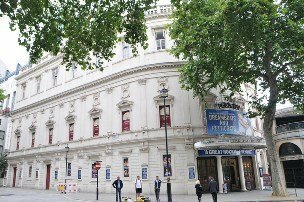 The theatre re-opened as The Playhouse Theatre on 28th January 1907 with a one-act play called The Drums of Oudh together with a play called Toddles, by Tristan Bernard and Andre Godferneaux. Since that time the Playhouse has hosted the likes of W S Gilbert, legendary actress-manager Gladys Cooper, the BBC, The Almeida Theatre Company, The Peter Hall Company, and Janet McTeer. In January 2003, Maidstone Productions took over the ownership of the Theatre. Maidstone Productions, owned by London and Broadway producers Ted and Norman Tulchin, has been behind a number of hit productions on both sides of the Atlantic. In March 2003, the Ambassador Theatre Group took over the ownership of the Playhouse Theatre.